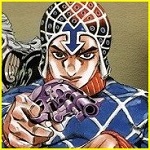 Last month's thread is here. UFC July saw some pretty sizable shakeups as well as a grouping of some awesome fights. This however led to a discussion about why UFC viewership has dropped. One person posited decided it was because of the US President. There was an article a few years ago on the close correlation between someone's favourtie sports and their political affiliation/engagement. 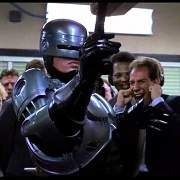 PGA was, unsurprisingly, very right wing, but UFC fans were, on the whole, way over on the left. Do you think, in a roundabout way, White's association and occasional, half hearted defence of Trump is somehow hurting their numbers? I mean, there's a lot of reasons the UFC is hurting, but could that be part of it? It's already perceived by a lot of people as the chosen sport of the far right, even though, according to that article, it isn't. July saw the UFC bounce around providing a fun array of events ranging from the TUF 27 Finale to a rematch that took years to sort out. First at the TUF 27: Undefeated finale, two UFC hopefuls secured their position. The tournament winners were Mike Trizano and Brad Katona in their respective Lightweight & Featherweight brackets. Both fighters won through a decision that doesn’t seem to put a lot of hype behind them immediately. In that night’s main event, Israel “The Last Stylebender” Adesanya TKO’d Brad Tavares in a slick display and helped himself break into the top 10 Middleweight rankings. Watch the fight, it was a really great performance by Adesanya. The following night at UFC 226, we saw a great card that would’ve been better had it not been A) for Max Holloway suffering some sort of issue that rendered him unintelligible when speaking (more so for him usually), and B) the Derrick Lewis/Francis N’gannou fight. With those two factors removed though, UFC 226 was all around a great event. Khalil Rountree pulled off what was an upset when he TKO’d kickboxing veteran Gokhan Saki in the opening fight of the PPV. Anthony Pettis looked more like his old self with his submission victory over Michael Chiesa, who announced at the official weigh ins after he missed weight that he would no longer be fighting at Lightweight. Mike Perry & Paul Felder put on a slugfest at Welterweight that we all were hoping for that went the distance. Perry’s edged out a decision victory over the Lightweight Felder. The co-main event was a snoozer where Derrick Lewis fought an admittedly scared Francis N’gannou in three round decision that went Lewis’ way. The fight was the 2nd lowest output of strikes in any UFC bout in the promotions 25 year history. In the main event Daniel Cormier and Stipe Miocic faced off in a Heavyweight title. 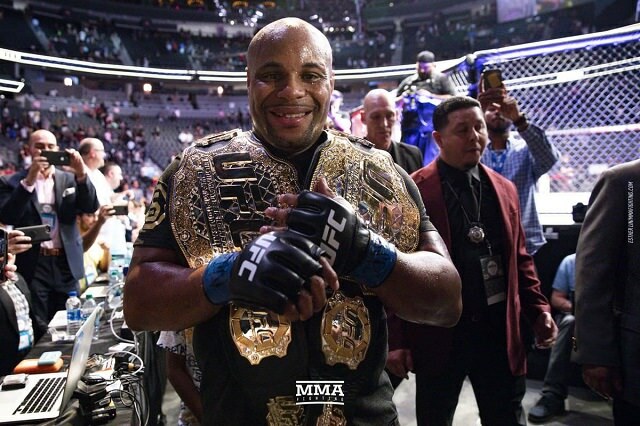 With a matchup many thought would last longer than a round, Daniel Cormier was able to knock off the UFC’s greatest Heavyweight to date, and become a dual champion in both the Light Heavyweight division and now the Heavyweight division. Cormier’s Heavyweight MMA record now stands at a truly impressive 14-0. Shortly after the UFC traveled to Idaho for a UFC Fight Night with former Heavyweight champion Junior Dos Santos facing Blagoy Ivanov. The card overall wasn’t bad but nothing hugely notable occured. JDS won in a decision victory, Sage Northcutt got a KO, Chad Mendes returned and won via TKO and Cat Zingano also got back into the win column. A week after that the UFC flew to Germany for another Fight Night that also wasn’t super high profile. Shogun Rua faced off against Anthony Smith in a Light Heavyweight matchup, where the aging Pride GP Champion had his 3 fight win streak snapped via a TKO stoppage courtesy of Smith. Finally the UFC returned to Canada for another UFC Fight Night, this time Lightweight contenders Eddie Alvarez and Dustin Poirier met in a rematch after their last bought was declared a No Contest thanks to illegal knees thrown by Alvarez. In the main event Dustin Poirier and Eddie Alvarez’s secod scrap almost took a turn for the worst and repeated the controversial finish when Alvarez threw a 12-to-6 elbow and was reprimanded by referee Marc Goddard. However Poirier was able to continue and eventually got the better of Alvarez winning through a TKO in the second round. In the co-main event, Jose Aldo got back into the win column after nearly being put away by Jeremy Stephens. Aldo won via a TKO stoppage late into the first round, stopping Jeremy Stephen’s three fight win streak. Joanna Jędrzejczyk was the other former champion who earned a victory that night as well. 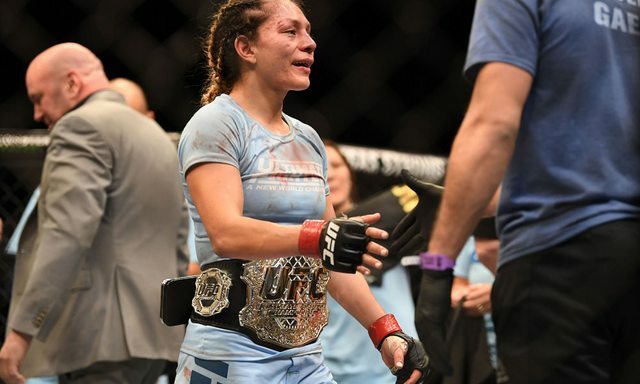 In a three round scrap against fellow Strawweight contender Tecia Torres, Joanna outstruck her opponent and stuffed her take down attempts for three rounds en route to a decision victory. The UFC will be taking a slower schedule this month as there are only two events scheduled. First, on August 4th there is UFC 227: Dillashaw vs Garbrandt 2 which takes place in Los Angeles, California. The main event will the continuation of a grudge match between former Bantamweight Champion Cody Garbrandt and current Bantamweight Champion TJ Dillashaw. The two paired off at UFC 217 wherein Dillashaw KO’d Garbrandt to reclaim the title. The immediate rematch is a bit puzzling but most are down to see how it goes a second time as Garbrandt did drop TJ at the end of the first round, before being put out in the 2nd. The co-main event for that PPV will also be a rematched title fight as Flyweight Henry Cejudo gets a second opportunity to beat Flyweight Champion Demetrious Johnson. The pair first faced off at UFC 197 which saw Johnson quickly, and rather easily, dismantle Cejudo in route to a TKO victory. Since then Cejudo has gone 2-1, losing to other top Flyweight challenge Joseph Benavidez. Cejudo’s striking has significantly changed as a result as well and so a rematch could see a different result, or Johnson will simply outclass his opponent and further his title defense record. Then towards the end of the month the UFC travels to Lincoln, Nebraska on August 25th to host UFC Fight Night: Gaethje vs Vick. The main event pits UFC Lightweights Justin Gaethje against James Vick, with the marketing being all about the knockouts (the majority of which Gaethje owns). Gaethje is coming into the fight on a two fight losing streak, having been put away by both Eddie Alvarez and Dustin Poirier in his most recent outings. James Vick is stepping up to fact a Top 10 ranked opponent, bringing in his four fight winning streak to the table. The rest of the card will host bouts featuring Angela Hill vs Courtney Casey, Michael Johnson vs Andre Fili, Mickey Gall vs George Sullivan, and more. UFC 227 was expected to have Light Heavyweight contender Alexander Gustafson face off against Volkan Oezdemir but on July 19th Volkan pulled out of the fight citing a broken nose. This was ahead of the Anthony Smith and Shogun Rua fight which many thought could set up a possible replacement for Gustafson. In the time it took Smith to TKO Rua and get to the post fight press conference, Gustafson’s camp announced he was pulling out of UFC 227 with an injury which many took as an opportunity to mock Gustafson over. Including UFC LHW & HW Champion Daniel Cormier, who firmly stated he will refuse to fight Gustafson for his recent behavior. Additionally the UFC announced that the recently won Interim Welterweight Championship claimed by Colby Covington is now going to be stripped as Covington could not agree to a fight schedule the promotion wanted. Instead current Welterweight Champion Tyron Woodley will now be facing Darren Till in a title fight come September 8th at UFC 228. Brock Lesnar has also returned to the sport and will undergo six months of USADA testing before being expected to fight for the UFC Heavyweight title against Daniel Cormier. The earliest Lesnar could fight is the beginning of 2019. Starting his career as a Heavyweight, Daniel Cormier went 13 fights in the division undefeated. When he moved down to Light Heavyweight many thought he would never return to the division nor ever get the chance to become the UFC Heavyweight Champion due to his friendship with former Heavyweight Champion Cain Velasquez. That all changed when the opportunity for a superfight presented itself with Cormier stepping back into the Heavyweight ranks to take on the UFC’s longest reigning champion, Stipe Miocic at UFC 226. The stars aligned for Cormier, as well as getting a little bit of help from a few errant eye pokes, as he knocked out Miocic and become the UFC’s second person ever to hold two division titles at the same time. Following his win DC faced off a returning Brock Lesnar in a post fight trash talk session inside the cage and the two seem to be destined to fight. This will have to take place before Cormier’s previously announced retirement date of March 20, 2019. Lesnar will also be undergoing 6 months of USADA testing, which puts his earliest fight date at around January 2019, just a few weeks from Cormier’s intended retirement day. Daniel Cormier won the belt initially in May of 2015 against the heavy-hitting Anthony Johnson by rear-naked choke in the third round. Cormier defended his belt against Alexander Gustafson in October of 2015 in a split decision. A planned rematch against Jon Jones was scheduled for UFC 200, which was called off after Jones tested positive for post-cycle therapy drugs. Cormier went on to fight Anderson Silva in a non-title bout on three days' notice. Cormier was slated to fight Anthony Johnson in a rematch for the belt in December, a match which did not took place due to Cormier suffering a groin adductor injury. The bout took place at UFC 210 in April, with Cormier defending the belt in under two rounds and Johnson riding off into the sunset with a surprise retirement. The rematch against Jon Jones finally took place at UFC 215 and saw Jones KO Cormier in the third round. Then Jones tested positive for Soviet-era steroids, and the CSAC overturned the fight result to a No Contest. The UFC dutifully stripped Jones of the championship, again, and it is now back around the waist of Cool MMA Dad Daniel Cormier. DC showed the world that there are indeed levels to this game, and defended easily against Volkan Oezdimir at UFC 220 in January. 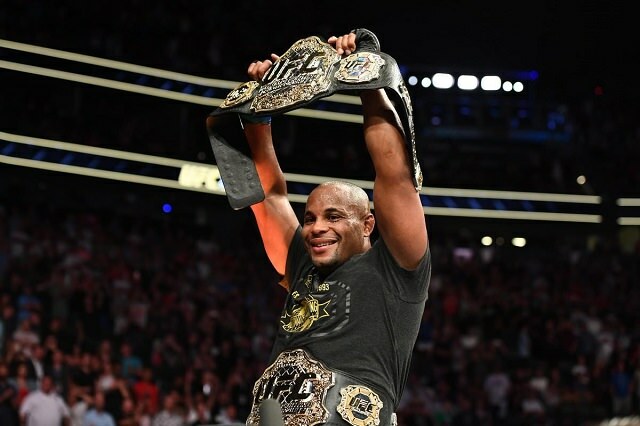 Then at UFC 226 Cormier cemented his legacy by knocking out UFC Heavyweight Champion Stipe Miocic to become the second ever person to hold two weight division belts at the same time. Cormier then proceeded to call out former UFC Heavyweight Champion and the WWE’s Universal Champion Brock Lesnar who was in the audience. The two exchanged words and a bit of shoving on Lesnars part and it is pretty clear this will be the next Heavyweight fight for Cormier provided Lesnar passes his 6 months of USADA testing. Whittaker rode a seven-fight winning streak, including shutting down the deadly takedowns of Ronaldo "Jacare" Souza to slot himself into an Interim Middleweight championship match against Yoel "Soldier of God" Romero. The canny Australian showed incredible heart in taking it to the Cuban Olympic silver medalist over five rounds, and even with a severe knee injury coming in the first he managed to outpoint his opponent to take the unanimous decision. 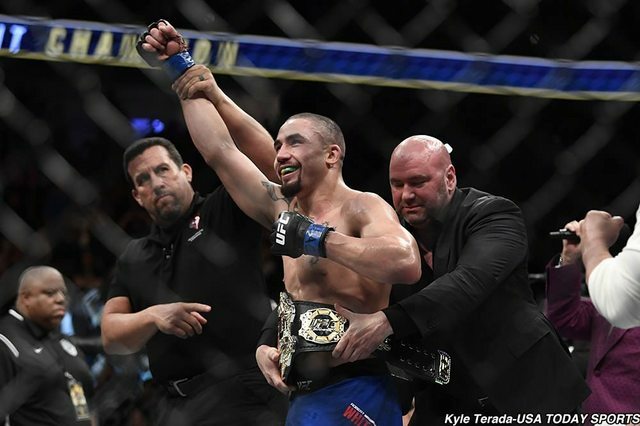 With Georges St-Pierre vacating the Middleweight championship in early December 2017, Whittaker has now been promoted to Undisputed Middleweight Champion. After a layoff to get his health back together, Whittaker took on Yoel Romero at UFC 225 in another great showdown between the two with Whittaker again taking the victory and continuing his reign as MW king. Woodley was promised a title shot against the Welterweight champion 17 months before the fight took place. 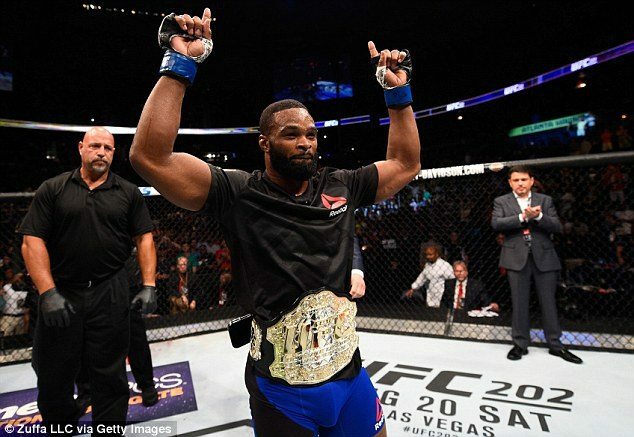 After Robbie Lawler put in Fight Of The Year performances against Rory MacDonald in July 2015 and Carlos Condit in January 2016, Woodley went into their fight in July of 2016 as a significant underdog. This meant nothing, with Lawler going down to strikes in the first round. Woodley defended his belt against Stephen "Wonderboy" Thompson, putting on an incredible fight that ended in a majority draw at UFC 205 in New York in November 2016. A rematch for this fight was held in March month at UFC 209, with Woodley again the winner in a stilted affair. He defended the title again at UFC 214 in late July 2017 against Demian Maia, following a conservative but sharp gameplan that saw him stop all 22 of the Brazilian Jiu-Jitsu ace's takedown attempts. It was announced that at UFC 228 on September 8th, 2018, Woodley will be facing off against England’s Darren Till. Finally, it's Khabib Time. After going 16-0 in regional promotions in Russia and The Ukraine, Khabib signed a deal with the UFC in late 2011. He then went on a near-unprecedented tear in the promotion, racking up a 9-fight UFC winning streak, including setting the record for the most takedowns in a single UFC fight with 21 against Abel Trujillo. 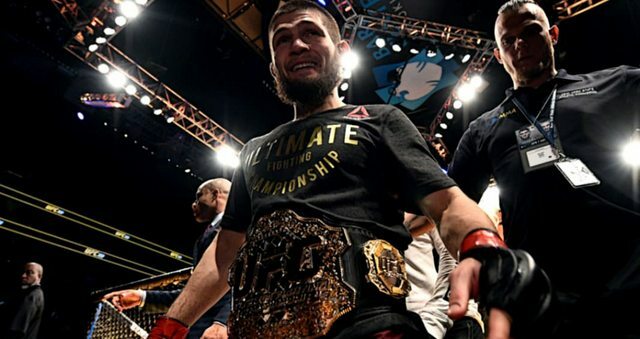 While he seemed to have some issues with his weight, coming in heavy a few times and pulling out of a bout, and had recurring issues with his knees, causing the cancellation of more than one fight, it seemed like only time would be the barrier betewen him and a Lightweight title shot. Finally in 2018, the fight was booke for UFC 223 against Tony Ferguson. The week of the fight it seemed that literally nothing could go right, and after Ferguson seriously injured his left knee at a press event, and the late replacement Max Holloway was pulled out with 36 hours to go via a NYSAC ruling that he "didn't look good" , finally it was settled that Al Iaquinta would be Nurmagomedov's victimopponent for the bout. Iaquinta weighed in at 155.2, over the championship limit, and as such was ineligible to win the title. That distinction ended up being purely academic, with Nurmagomedov turning in a 50-44, 50-43, 50-43 performance to finally wrap the belt around his waist. 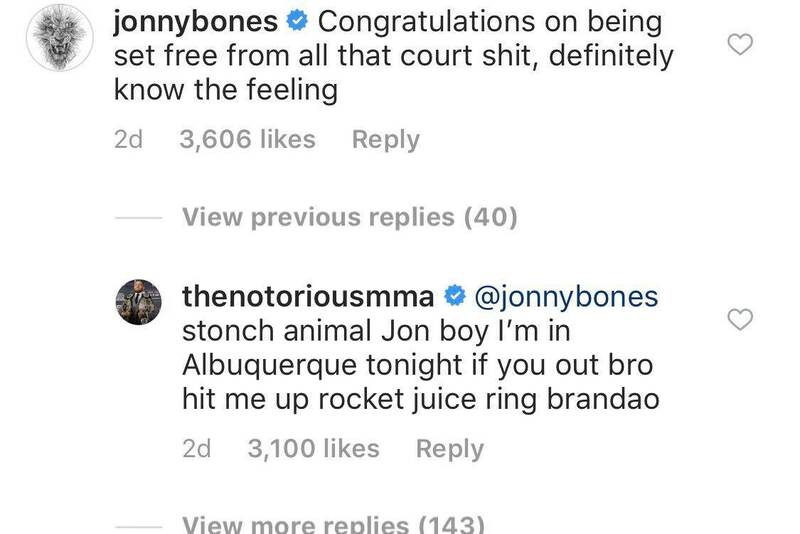 No opponent is announced as yet, but with the Lightweight division so stacked at the top end, the contenders are all jockeying for position and agitating on social media for the fight. I personally think it's going to be Khabib time for a long time. 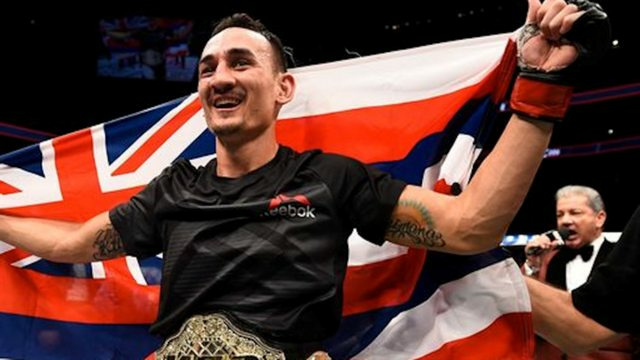 Holloway put together a 9-fight win streak, with several Performance of the Night bonuses, before answering the call to contend for the Interim Featherweight Championship at UFC 206 in December 2016. Taking out Anthony Pettis with a body kick and punches late in the third round, he set himself up for a unification bout against Jose Aldo at UFC 212. At that event in early June 2017, he defeated Aldo in the third round with focused ground and pound, and unified the belts. Frankie Edgar was announced as Holloway's first defense, but with Edgar out with a broken face, the rematch with Jose Aldo Jr took place at UFC 218 in early December 2017. It was a carbon copy of the first match, with Aldo unable to weather the combinations of The Blessed One, this time being stopped in the third round. Holloway was again scheduled to defend against Frankie Edgar in March 2018, however a leg injury to the champion has forced that fight to the co-main with Brian Ortega stepping in. Travesty struck once again as Holloway had to pull out of UFC 226 with “concussion like symptoms” which to date has resulted in no future fight for him being scheduled. When he was announced as the coach on The Ultimate Fighter: Redemption against then-champion Cody Garbrandt, the outcome was planned to be a fight between the two for Garbrandt's Bantamweight championship. While the fight between the two was originally announced for July 8 2017 at UFC 213, Garbrandt dropped out with a back injury during May, and it was re-booked for UFC 217 in November. Dillashaw started a slight underdog, but got the job done in the second round with a solid right hook and follow up ground and pound. 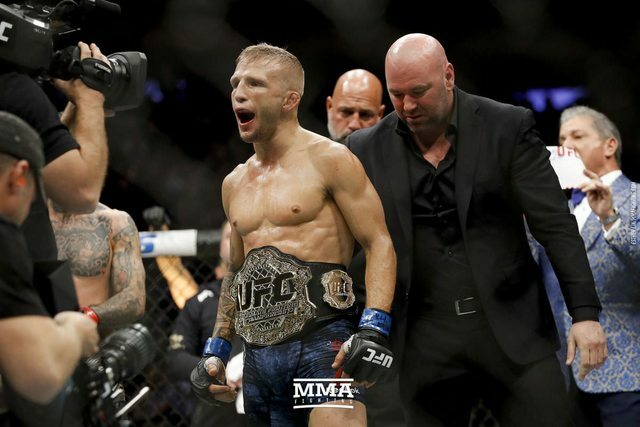 With his second title reign starting, Dillashaw's next title defense is currently scheduled to be at UFC 227 in August, a rematch against Garbrandt. After winning the Flyweight Championship in September 2012 in a split decision against Joseph Benevidez, Johnson has amassed a 10-fight streak against the best that the division has had to offer. He has been so dominant that the UFC held an entire Ultimate Figher tournament to find his next challenger. The culmination of this was that Tim Elliott came back out of the MMA wilderness to lose a competitive match against Johnson in early December 2016. Johnson easily defended his title against Wilson Reis in April 2017, tying the all-time title defense record held by Anderson Silva. His next was scheduled to take place at UFC 215, with Ray Borg the chosen recipient of a life-altering mauling, but Borg pulled out with an unspecified illness. This match was re-scheduled for UFC 216 on the 7th of October, which saw Johnson soundly beat Borg for four and a half rounds. The champion then casually threw his opponent over his shoulder and grabbed his arm on the way down for a GOAT-level submission win. Johnson’s next fight will be against Henry Cejudo for a second time, with Cejudo seemingly fighting completely differently than how he looked the first time he earned himself a title shot. That matchup will take place at UFC 227 in August. With the vacating of this championship by Germaine de Randamie in May 2017, a match was set up for UFC 214 between Justino and Megan Anderson. Anderson pulled out of the fight in late June, and was replaced by current Invicta FC Bantamweight Champion Tonya Evinger. The significantly larger fighter on the day, Justino dominated a one-sided affair and won the fight in the third round with brutal knee strikes. Justino defended her championship against Holly Holm at UFC 219 in December 2017, again being the much larger fighter and keeping Holm at bay to take a comprehensive decision victory. Justino made her next defense against promotional newcomer Yana Kunitskaya in March 2018, flattening another promotional newcomer and Featherweight debutant in a very one-sided matchup. Nunes headlined UFC 200 in July of 2016, putting a vicious beating on Miesha Tate and securing a rear-nake choke victory in a little over three minutes. 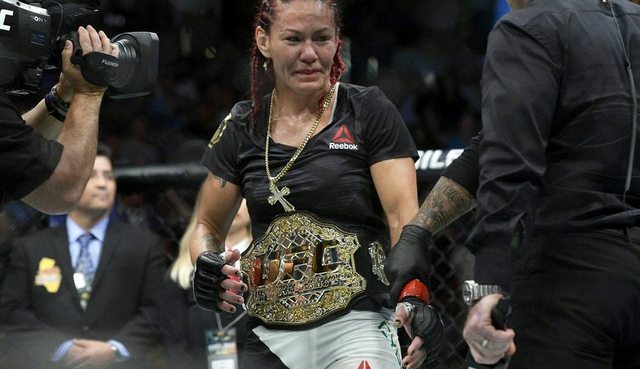 She backed this up with a brutal 48-second TKO victory against former Women's Bantamweight Champion and WMMA pioneer Rounda Rousey in late December 2016. Nunes was slated to take on Valentina Shevchenko in a rematch of their March 2016 fight, with that match being moved to UFC 215 in September 2017. Nunes retained by a razor-thin split decision. Her next fight was against Raquel Pennington at UFC 224, which was held this month in Rio de Janeiro. Nunes spent four rounds mauling Pennington, then pounded out a clearly already finished Pennington in the fifth, to retain her Championship. After amassing a 5-0 record as an amateur, Nicco turned pro in late 2015. Going 3-2 before signing up to The Ultimate Fighter: A New World Champion, Nicco used her tenacity and solid striking game to garner three decision wins in a row on the reality show. Originally slated to face Sijara Eubanks at the TUF Finale, she ended up taking out a hard-fought decision victory over Goon favourite Roxanne Modaferri to become the first UFC Women's Flyweight champion. No defense is announced at this stage, but Valentina Shevchenko has been announced as the number 1 contender. Montaño was recently in a social media feud with Ariel Helwani over the latter's claims that she's ducking or scared of Shevchenko, with Montaño responding with the fact she had had tonsil and adenoid surgery and wasn’t able to train for a fight immediately. The Schevchenko fight has been announced to be taking place at UFC 228 in the Co-Main Event. After cleaning out the Women's Strawweight division, Joanna Jędrzejczyk seemed to have no more mountains to conquer. 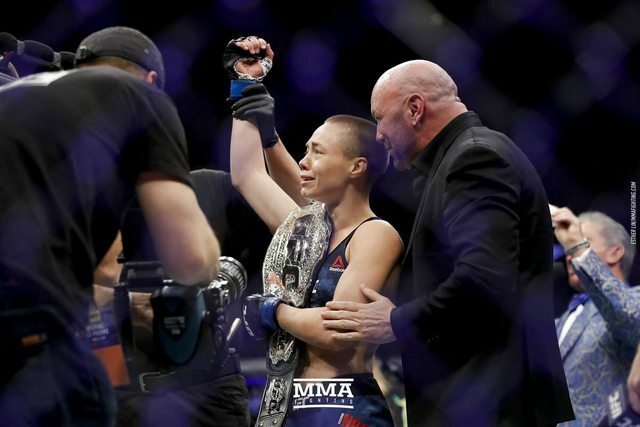 After beating Michelle Waterson by rear-naked choke in April 2017, Namajunas was announced as the next contender for want of any other new challengers. In a massive upset, Namajunas beat Jędrzejczyk by TKO in the first round of their championship fight at UFC 217. A rematch for this fight took place at UFC 223 in April 2018, and while it took longer to decide the result was the same, with Namajunas taking a solid unanimous decision over the former champion. No title defense is scheduled at this stage. Go to the MMA's Best and Worst, 2018 Edition thread administered by Fentry to refresh your memory on what has been considered by your fellow PSP-MMA posters as the best (and worst) of the MMA world this year. 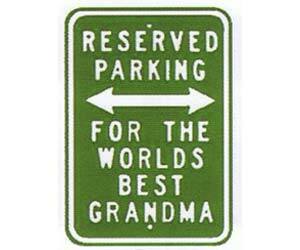 Nominations for hilarious and/or awesome things are always appreciated. Season 2 of Dana White's Tuesday Night Contender Series is in full swing, with the thread for discussion of that UFC-adjacent event found here. If you’re itching for some UFC or even Z-League content check out the UFC Fight Pass thread UFC Fight Pass Thread - Earning Your 3rd Degree Blackbelt In MMA Posting. This thread is being updated approximately every week by me with information on new and upcoming additions to the streaming service, random fight cards like Karate Combat, Glory SuperfightSeries, Eddie Bravo Invitational, and is also good for general banter about old fights. UFC is about to launch their own 30:30 style documentary series with 25 different documentaries to help celebrate the 25th anniversary of the UFC. August’s UFC Fight Pass Fight Of the Month is TJ Dillashaw vs Cody Garbrandt at UFC 217. Shout out to DumbWhiteGuy for providing details for the MMA IRC channel. 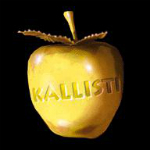 Join your fellow MMA fans in discussing all things MMA in a place probably secure against nuclear armageddon - IRC has been around for so long I'm not convinced anything could kill it. Shout out to Memento for setting the standard of OPs for the UFC threads that helped make this one possible. As usual if there’s any mistakes please let me know and I’ll fix it as soon as I can. He has come home, where he belongs. The Ancient Mariner returns to lead his first team to glory, forever and ever. Amen! I look forward to news of McGregor crashing a helicopter into an orphanage while tripping on DMT. 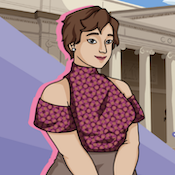 Here's the thing, I'm a feminist. I hope Cruz is going to be on the commentary team. It was worked so effortlessly into the combo. It was magnificent. Commission vetoed Bethe Correia from being able to fight because of an eye surgery she recieved last year. I'd just like to apologize to all commissions, I've said some unkind things in the past, but they really came through for me on this one. If Fightpass did a livestream of Conor and Jones on a night out together it would break all viewership records. With Jędrzejczyk's win, what next for her? I feel like there isn't much interest or intrigue in yet another rematch with Rose. Depends when Rose is back. Joanna's been giving pretty unhinged interviews where she talks about being the true queen of the division. So, insanity is probably next. Rose arguably has her next challenger in the pipeline. She probably needs another win or two to have an argument. I hope she doesn’t end up making GBS threads in the woods and marrying a tiki-themed turd golem. 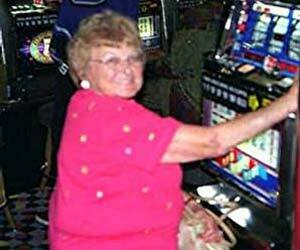 bigamy's illegal, so she'd have to find another one. She literally walked out of the cage after getting starched shaking her head and waving her finger in the air to say she was still number 1. It's a really lovely matchmaking spot, because Joanna doesn't really deserve another title shot but she's also beaten the rest of the top six in the division. Safest bet is the winner of Kowalkiewicz/Andrade is the next contender, and Esparza/Suarez is on the undercard, so you probably have Joanna fight the winner of that because she'll almost certainly murder either one of them and make her case for yet another shot. The highest ranked person coming off a win who isn't booked is Ansaroff at 13, but she's also on a 3 win streak. If Zhang knocks out Taylor this weekend, I'd go wild and throw her in with Joanna. That's assuming the UFC doesn't want to sacrifice either Suarez or Andrade upon the altar of Jowanna-unnn-yun-zzik, in the event they win. In a true triumph of MMA journalism, mmajunkie suggested Joanna should fight Michelle Waterson next. I'm not sure, but it might not be legal to sanction a murder and show it on live TV. jj hit andrade in the face for 25 minutes straight and not only was andrade not hurt she felt chipper enough to propose marriage to her girlfriend immediately after the fight. p4p, jj is perhaps the most feather-fisted champ in the history of the ufc. 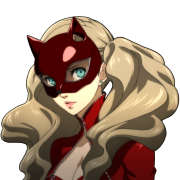 what i'm saying is, she isn't murdering anyone.